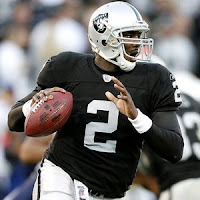 Ex-Raider QB Russell Arrested; Blows Shot with the Jets - Fantasy Football, Fantasy Football Rankings | Mac Bros.
Former Oakland Raiders QB JaMarcus Russell , chosen No. 1 in the 2007 NFL draft, was arrested in Mobile, Ala., and charged with possession of codeine syrup, a controlled substance, without a prescription. Russell, 24, was busted at his home during an undercover investigation and booked into the Mobile jail, where he was later released on $2,500 bond. The mega-million paid NFL dud, who excelled at LSU, was also on the radar of the New York Jets until the bust. Sources say that the Jets are no longer interested. Of course, we wouldn't draft him for our fantasy football team if we had to fill a 75-man roster and have at least one player whose name rhymed with LaTarcus Bussell. Just sayin'. Sources: New York Times and NY Daily News.